At one point in the 1990s, Julie Van Rosendaal, the popular Calgary-based cookbook author and CBC Radio food columnist, ran a bakery called One Smart Cookie. She eventually shut it down, exhausted by the long hours, but in 2000, Van Rosendaal self-published her first cookbook, named after the shop. It didn’t occur to her to approach a publishing house, because she believed that going out on her own was possible, thanks to the women behind the Best of Bridge cookbook series. In its more than 40 years of existence, Best of Bridge has sold more than four million copies and become one of Canada’s most enduring and beloved cookbook brands. “I got into food writing because they were an inspiration,” says Van Rosendaal, who came onboard in 2015 as a new co-author for the series. Van Rosendaal literally grew up with Best of Bridge and its no-nonsense approach to the kitchen. The women behind the books were her neighbours and Van Rosendaal was friends with some of their daughters. “They’re not celebrity chefs at all, and I think that was a great part of their appeal,” she says. The Best of Bridge origin story is something of a publishing legend. In 1975, eight Calgary women, all members of the same bridge club, took off for a weekend away. Their conversation inevitably turned to cooking – food was as important as the game – and how much they enjoyed preparing and sharing meals together. Somewhere in that discussion, the club decided to spread that simple pleasure – and their recipes – with others, and began planning the first Best of Bridge cookbook. After securing a $6,000 loan (from a bank officer reluctant to hand money over to female entrepreneurs), the women tirelessly promoted their debut collection, which they self-published in 1976. The book followed a simple formula: uncomplicated recipes for home cooks with straightforward instructions enclosed in a spiral-bound cover. Uninhibited by the structure of a traditional publishing house, the co-authors found unconventional ways to build distribution networks, through places like local realtor offices and drugstores. But their biggest marketing tool was the authors themselves. 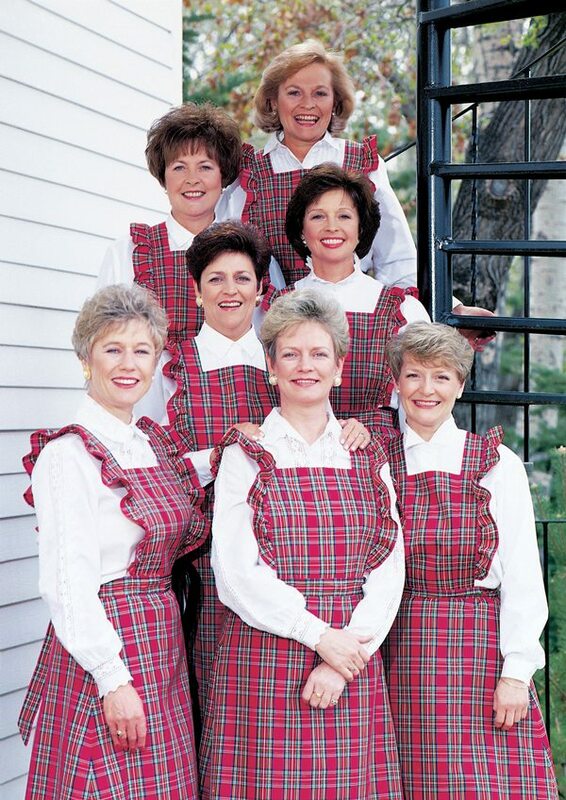 The self-styled Ladies of the Best of Bridge charmed audiences with their matching red aprons and general enthusiasm. In 2015, when the four surviving members of the Bridge team (one original member moved away after the first book, and three others have died) decided it was time to hang up the red apron strings, they approached Van Rosendaal to take over. Wanting to keep the spirit of the series alive, Van Rosendaal recruited her longtime best friend, Sue Duncan, and Calgary food blogger Elizabeth Chorney-Booth as co-writers.